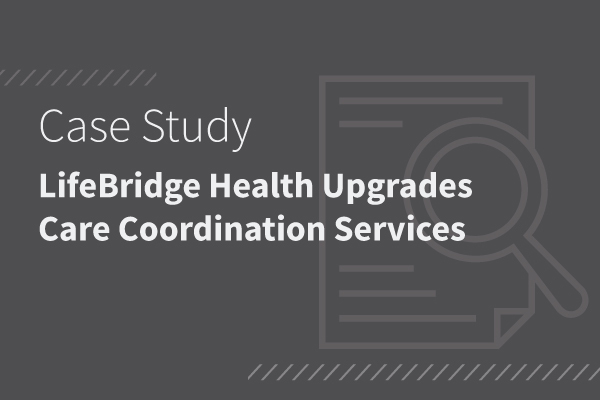 PROMPT, a care coordination platform deployed through CRISP and developed by Audacious Inquiry (Ai), enhances LifeBridge Health’s care teams’ workflow to benefit patients and minimize resource utilization. LifeBridge Health’s Northwest Hospital is a community hospital located in Randallstown, serving the health care needs of the northwest Baltimore metro area. Focused on patient-centered care, Northwest Hospital provides a variety of quality care services to the community, especially within the Emergency Department where patients are provided care navigation services. To provide extensive services, LifeBridge Health has partnered with HealthCare Access Maryland (HCAM) to assist patients with transitions of care and avoid acute-care encounters within the health system. Chesapeake Regional Information System for our Patients (CRISP), the statewide Health Information Exchange (HIE) in Maryland, launched its Encounter Notification Service® (ENS®) service in early 2012, to inform caregivers when patients under their care were in contact with a healthcare system. PROMPT is an extension of ENS that enables more timely access to alerts and improved workflows for care teams. Since June 2014, by tracking patients in real-time through ENS, LifeBridge Health has been able to monitor patient utilization across multiple hospitals (especially those outside of the LifeBridge health system) to connect patients with care coordination services and better transition to the next care setting, reducing avoidable Emergency Department visits. Such activity increases savings towards LifeBridge Health’s Global Budget Revenue model and creates opportunity to take advantage of revenuegenerating programs such as Transitional Care Management or Chronic Care Management. Since August 2016, the Northwest ED Navigation team has upgraded to ENS PROMPT, an enhanced, user-friendly platform receiving over 500 notifications per day for patients subscribing to navigation services at one hospital. Can mark each notification with a status tag (Not started, in Progress, Completed) to indicate to colleagues working the same list. Can quickly identify patients with chronic conditions or status changes by sorting, filtering, and segmenting patient lists into pre-defined settings or on-the –fly search fields. Multiple team members at different organizations can access patients’ event notifications through separate work queues. Connected with a care navigation team member prior to discharge and monitored as they transition from the hospital to their homes. • Less likely to default on prescription medication and follow-up appointments adherence. • Connected to the appropriate social service programs to address their specific needs.